2017 MLB Awards – Who Should Win Rookie Of The Year? You are at:Home»Seattle Mariners»2017 MLB Awards – Who Should Win Rookie Of The Year? As Major League Baseball heads in to the post-season, anticipation and speculation about the regular season awards intensifies. Clayton Kershaw or Max Scherzer for NL Cy Young? Chris Sale or Cory Kluber for AL Cy Young? Is there a case to be made for Sale as MVP? All these fun arguments and more. Fortunately, or unfortunately depending on your perspective, the two races for Rookie of the Year (ROY) aren’t even really very close. It’s Aaron Judge of the New York Yankees in the AL and Cody Bellinger of the Los Angeles Dodgers in the NL. In a more typical season, we might be discussing whether Mitch Haninger of the Seattle Mariners might have eked out Andrew Benentendi of the Boston Red Sox, the former with 2.5 WAR and the latter with 2.2 WAR. Paul DeJong of the St. Louis Cardinals would be a fine candidate in most years, hitting .285/.325/.532 with 25 HR in 443 PA. Just not in 2017. Not only did Judge break Mark McGwire’s rookie HR mark of 49 HR by hitting 52, he totally eclipsed the former holder of second place back in mid-Auigust, Hall of Famer Frank Robinson, who hit 38 in 1956 with the Cincinnati Reds. Robinson would go on to hit 586 HR. Of course, McGwire would hit 583 but he’s not sniffing the HOF with the current baseball writers doing the voting. Judge led the AL in HR and came in second behind Giancarlo Stanton of the Miami Marlins, who hit 59, in all of baseball. In 155 games and 648 PA, Judge’s final regular season stat line is .284/.422/.627 with 52 HR, 114 RBI, 128 R, and 9 SB. Yea, that behemoth of a baseball player steals bases every once in a while too. His walk rate of 18.7% is excellent and although his batting average on balls in play (BABIP) leveled out from the .400+ at the all-star break, .357 still might be unsustainable over a larger sample. I’d expect his BA to come down some next year, but he could easily sustain the high OBP. Judge’s FanGraphs WAR of 8.2 actually makes him the leader in the clubhouse in front of Houston Astro’s shortstop Jose Altuve (7.5) for MVP. Altuve does lead Judge in Baseball Reference WAR (8.0 to 7.8), a metric that uses a different defensive component which weights in Altuve’s favor, as he plays the more difficult position. But, if we’re haggling about a 7.8 WAR or 8.0 WAR when discussing a rookie, we are kind of missing the point. The 2017 season of Aaron Judge is a generational type of season. Back in 2012, when Los Angeles Angels rookie, Mike Trout, put up 10.3 fWAR on his way to ROY and a second-place finish in MVP (a likely outcome for Judge), he hit .326/.399/.564 with 30 HR, 83 RBI, 129 R, and 49 SB, while playing a stellar centerfield. A good portion of that season’s WAR value came on the base paths and with superior defense. Trout has since run less and regressed defensively. Judge in his rookie season walked more, got on base at a higher clip, and exhibited more power. 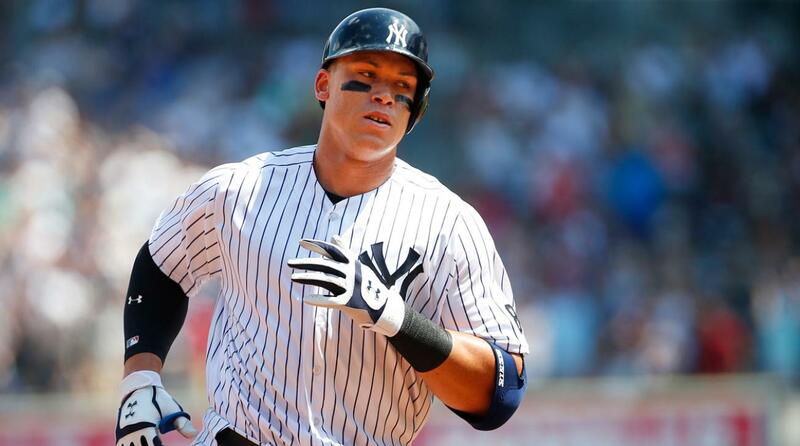 In this new, fun age, of the young superstar – Bryce Harper, Manny Machado, Trout, Francisco Lindor, Corey Seager, Bellinger, Trea Turner, Carlos Correa – the list goes on and on – Aaron Judge should be a force to be reckoned with for some time to come. Aaron Judge is your AL ROY. Cody Bellinger finished the season second in FanGraphs WAR for position players with 4.0, behind only Judge, and a full win ahead of Paul DeJong of the Cardinals in the NL race. The irony with Bellinger is that he may not even be the best rookie on his own team. Austin Barnes played in 30 fewer games for the Dodgers and came to the plate 286 fewer times but had a higher wRC+ and arguably a better slash line, albeit in a smaller sample. The glut of talent on the Dodgers may have cost Barnes more playing time and as a result, Bellinger has the counting numbers and the overall value. In 132 games and 548 PA, Bellinger hit .267/.352/.581 with 39 HR, 97 RBI, 87 R, and 10 SB. Poor Frank Robinson. In the course of one season, he went from being second on the rookie HR list to being fourth. And no one is talking about Bellinger’s feat because of Judge’s accomplishment. Bellinger had a more human BABIP at .299, so it’s likely his slash line this season will be closer to numbers in the next few years than those of Judge with the .357 BABIP. With no real challengers, Cody Bellinger is your NL ROY. One of the things we tend to forget is the age of these rookies and some of their contemporaries. Bellinger turned 22 during this season, like three months ago. Judge is a little older at 25. So, there is time for improvement. To put it into perspective, Mike Trout just turned 26. Kris Bryant of the Chicago Cubs will turn 26 in January. Bryce Harper will turn 25 during the post-season. This trend is highly prevalent across baseball right now – not only good young players, but superstar young players who are exciting to watch. (I feel bad about how many I’m leaving out). And while I’m certain there are hordes of MLB fans who are not relishing the idea of a re-stocked Yankees team and the possible rekindling of Yankees v. Dodgers World Series, this year’s ROYs are going to be special.